PHILADELPHIA, UNITED STATES — “Ladies and Gentleman, please welcome the President of the Republic of Chile, Her Excellency, Michelle Bachelet.” And with those words the Chilean presidential retinue was led into the Bellevue Stratford ballroom by the Chamber’s President Robert Palaima. 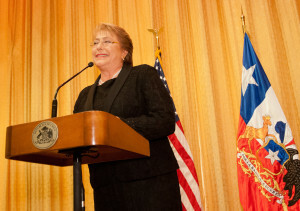 This is the first time a sitting Chilean president made an official state visit to the Chamber and she had extraordinary words of praise, encouragement and appreciation. 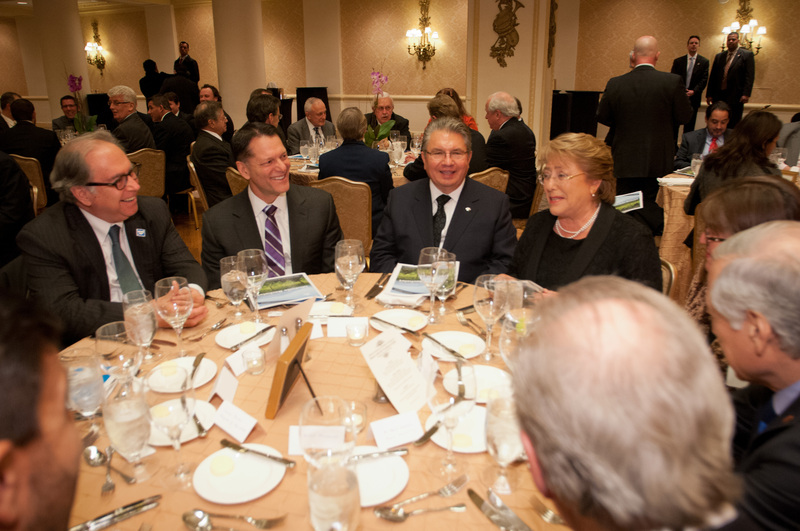 The unprecedented official state visit was commemorated with a sold-out awards dinner where over three hundred business leaders and guests saw President Bachelet receive the 2015 Friendship Award of the Chilean & American Chamber of Commerce of Greater Philadelphia. Together, Chile and the Chamber have been major engineers of Chile’s rocketing rise to prominence as a world food supplier. After a hearty and lengthy standing ovation, President Bachelet commended the special fellowship between the Delaware Valley and her country. The history of Chile’s success with their partner, the Greater Delaware Valley region, hinges on Chile’s reverse growing season, which, last year, brought in winter and year-round produce of more than 750,000 metric tons (MT), with grapes, apples, blueberries, cherries, citrus fruit and avocados” topping the list, according to Chilean Fruit Exporters Association (ASOEX) president, Ronald Bown, who was also part of the presidential delegation. In the 1970’s when this highly nutritional import-export effort first began, it was a revolutionary step-up in American food availabilities and profoundly changed the American dining table and cuisines. 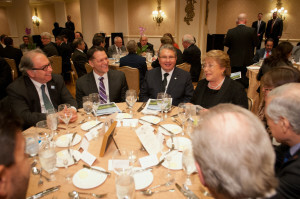 Bachelet’s unprecedented presidential mission to the Chamber throws more high-beam spotlights on the highly acclaimed, extraordinary alliance between the Greater Philadelphia Region and Chile and the jobs they’ve created together: over 100,000 Chilean jobs and some 12,000 jobs in the Delaware Valley. In the person of Leo Holt, President of Holt Logisitics, we find representation of four generations of the people on the United States’ side of this winning equation. Holt’s grandfather worked with the pioneers of this international success story, the visionary trailblazers like the Kopke’s, Vandenberg’s, Schiro’s, David Del Curto and all the other groundbreaking leaders who irrigated a desert, turned it green, created award-winning grapes and produce and then built the Chilean economic powerhouse from the Copiapó Valley to the Ports of the Delaware River. The Delaware Valley leads the way bringing in about 70% of all of Chile’s fruits and produce. The remaining 30% is split between ports in Los Angeles, Long Beach and Miami.